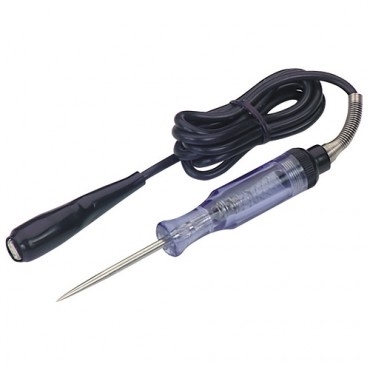 This Circuit Tester is available from Harbor Freight for about $4. This is the unit we recommend for troble shooting your electrical system in our course on Electrical Systems Troubling Shooting. There are several things we like about it. It has a rugged design, an extra long, 5 foot, cord, a sturdy cable clamp, and a very reasonable price. If you have never used a Circuit Tester you should take a look at our Electrical Systems Troubling Shooting course. What is nice about a Circuit Tester is that while both hands are busy manipulating the wires and tool you don't have to look away from what your are doing to read a voltmeter. The light in the handle simply lights up to tell you if current is present.